Asian long-horned beetles in North America. Tropical parakeets in the capital cities of Europe. The plague of frogs Bart accidentally unleashed that time the Simpsons visited Australia. Yes, invasive species are a growing problem in our globalized world. And yet there's something absurdly uncommon about the animal invaders that, over the past quarter-century, have made a home-away-from-home in the area around Doradal, in the Antioquia department of northwestern Colombia. For one thing, they're big. Huge, in fact, and with long canine tusks. They're also linked in a very direct way to one of history's most notorious gangsters: Colombian cocaine king Pablo Escobar, who died 25 years ago. And with no natural predators in the area, they're multiplying, according to a recent article in the Spanish daily El País. They're hippopotamuses. Escobar's hippos, left over from when he was spent a sizable chunk of his drug money on exotic animals. And as far as anyone can tell, there are about 50 of them — maybe more. Counting them, as Carlos Mario Zuluaga, director of a Colombian government agency called CORNARE explains, isn't easy. "They're not cows. We can't get close to them," he says. "They're wild animals, and they're in the wild." We don't have a manual for how to handle them. During the height of his cocaine trafficking days, Argentine daily Clarin remembers, Escobar built a palatial estate called Hacienda Napoles — now a popular theme park — where he also created his own personal zoo, complete with giraffes, elephants, ostriches and yes, hippopotamuses. After law enforcement officials hunted down and killed the fugitive narco-terrorist in late 1993, Colombian authorities seized the property along with its animal inhabitants. But they missed something — four hippos — which Escobar had smuggled into the country with money he earned from all that coke he smuggled out. The animals survived, prospered and reproduced. And for years, no one in the area knew what to do about them. Given that they were among belongings left behind by the famous criminal, the animals were technically the responsibility of law enforcement. But going after hippos was the least of concerns in a country that is only now ending more than 50 years of civil war. 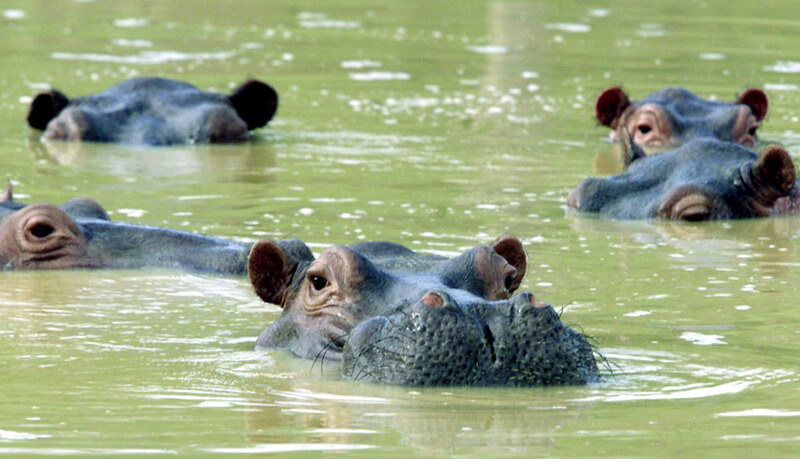 Finally, in 2013, funds were given to CORNARE, a river management body, to sterilize the hungry hippos — if they could. Not knowing the first thing about the African species, the agency used some of the money to hire biologists. They, in turn, came to the conclusion that the best thing would be to capture the animals and relocate them in zoos — before someone gets hurt. But that, as they've learned, is easier said than done. "We don't have a manual for how to handle them," says David Echeverry, one the CORNARE biologists. "There are a lot of them. They're loose. Free. They weigh three tons. And they can reach speeds of 30 kilometers an hour." No, it's worth mentioning again: they are not cows.